This innovative design was the result of customer feedback about the difficulty of santizing our traditional barbed stone when tubing was attached. 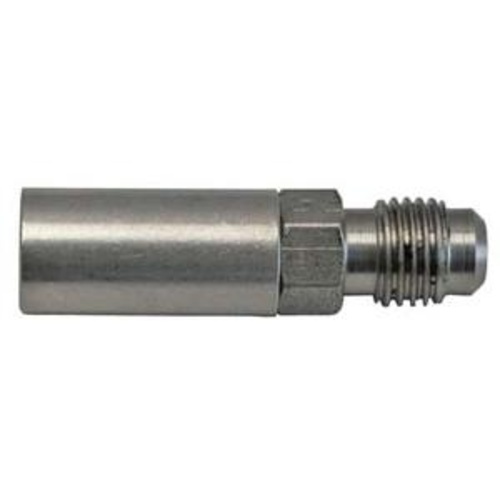 We added threads instead of a barb and now you can use the fittings you see at the bottom of this page to connect and disconnect your tubing. This allows you to place the stone by itself directly in a pot of boiling water to sanitize. Easy. To properly sanitize your stones, we recommend you run it in a sanitized solution for 5 minutes. If the stone becomes clogged we recommend boiling the stone for 1-3 minutes to help break down anything within it. The stone does not come with the barb fitting or flare nut - those will have to be purchased on their own. See the Related Items below. The .5 Micron stone is more commonly used for carbonation. However it can be used pre-fermentation with an O2 tank and regulator for oxygenation. Not the ideal choice if you want to aerate with an oxygen pump (aquarium pump) - use KEG590 for aeration. And if you are looking for a neat, all-in-on complete system for carbonation check out our Carbonating Keg Lid. BEST ANSWER: Those are 1/4 flare fittings. very common item. you can usually find them in the combination of a Nut & Stem/hose barb. I had two of these blow the sintered stone off the stainless steel fitting when I (slowly) increased the pressure until fine bubbles started emerging from the stone. Fortunately, B3 replaced one. Get the 2 micron stone instead. You will need less pressure to get the stone to emit bubbles. This is my second one I have purchased. First one lasted many years. Don't put in a pot of boiling water and forget it. I left mine in until it boiled dry and it separated the threads from the stone. That is not a fault of the product, mutual my mistake. I have used this for about a year, and it works great. It does take a bit of pressure to get through the small holes, but makes fine bubbles for better contact area. I use it inline with my plate chiller, and about 20 feet of tubing before it reaches my conical. I boil to clean, and sterilize before I use. Mount makes it easy to remove for cleaning. Just don't boil it dry, and make the sintered part separate from the mount part, like I did one time. I got the .5 instead of the bigger one , because I'm pushing pure oxygen into the wort. I decided it was important, after reading a lot on yeast and fermentation. I use 1 liter per minute Oxygen in my fermenter. After use I boil for a half an hour in a tiny pot. mUST keep it clean!!! You'll thank yourself! Was debating between .5 and 2.0 micron for O2, but it seems the .5 is marketed for carbonation while the 2.0 is marketed for O2. Is that not what your research indicated? I bought an oxygenating kit took my stone off to sanitize it and lost it, so I ordered this one and it works great. Great product the only one I found that I could add a 1/4" SS tube by regards the the flare fitting. Works perfect for my system, also doubles up as a quick easy disconnect for a carbing stone. I've been trying to figure out how people are using this with the 1/4" flare fitting. If with a swivel nut, the only 1/4" swivel nut flare fittings that I've seen in existence have chrome plated brass for the nut, with stainless steel only being the barb portion. This product works great and is easy to clean & store.Used to use an aeration stone from an aquarium, what a pain, and for a low price it's deffinitely a better way to good. I've been looking for a diffusion stone that makes it easy and effective to sanitize the stone and the hose. This helps me accomplish that.